Fraser Cameron is Visiting Professor at the Hertie School of Governance, Berlin, and Senior Advisor to the European Policy Centre. As a convinced pro-European Brit I never thought I would suggest that the UK needs a break from the EU. But the truth is there is an anti-EU virus in the British body politic that can only be cured by a period in the wilderness. No one can judge whether this will be 5, 10 or 15 years but hopefully it will lead to a new generation of politicians free from the virus and the UK can rejoin the EU and help make it stronger. Like most viruses, the anti-EU virus experienced a long period of hibernation and can be found in both major political parties. It is one of the ironies that it was a Conservative prime minister, Edward Heath, who led Britain into the EU, and another Margaret Thatcher, who was the strongest supporter of the Single Market. In 1975, it was a Labour prime minister, Harold Wilson, who sought to unite his divided party by offering (and winning 70-30) a referendum on Europe. Among those voting against was a certain Jeremy Corbyn. Labour continued to be divided over Europe in the 1980s leading to a split in the party and 18 years in opposition. Meanwhile, as Thatcher was forced out of office in 1990, largely because of her strident opposition to the EU, the Tory party started to split on Europe. John Major, who returned from Maastricht shouting ‘game, set and match’ to the UK, was confronted with a band of about 30 die-hard anti-EU rebels (‘the bastards’) who made his life a misery. The virus then went into hibernation under the pro-EU Tony Blair who easily defeated two Tory leaders who ran anti-EU campaigns in the 2001 and 2005. Blair’s successor, Gordon Brown, lost the 2010 election to David Cameron who was able to see off growing demands for a referendum in his own party by pointing to the veto held by his coalition partners, the Liberal Democrats. 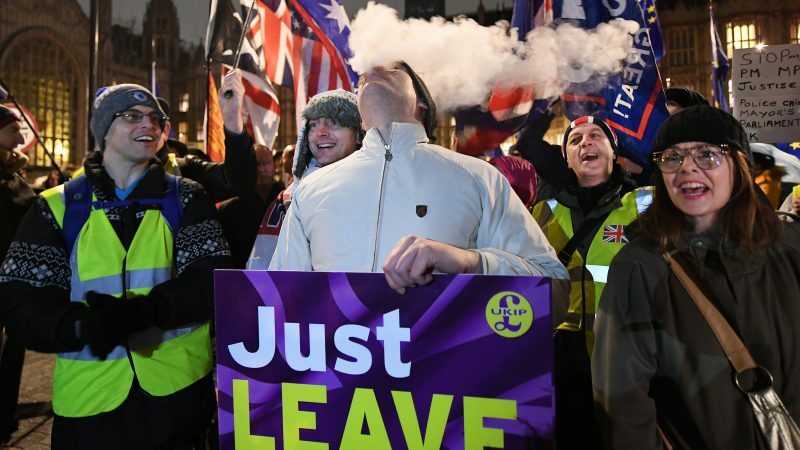 Under pressure from Ukip, who Cameron famously called ‘a bunch of fruitcakes, loonies and closet racists,’ the prime minister yielded to calls to include a referendum in the party manifesto for the 2015 election. When Cameron unexpectedly won an outright majority he felt he had to go through with the referendum, believing that he could easily win it. The rest is history. Cameron will probably go down as the worst prime minister in British history, although it looks as if Theresa May will run him a close second. Her bunker mentality, lack of empathy, poor political judgement (losing her Commons majority in an unnecessary election in 2017) and inability to reach across the political divide, meant that she has struggled to reach an agreement with the EU. And less than two months before Britain is due to leave on 29 March there is still no sign of an agreement. The past two years have been characterised by an outpouring of anti-EU bile by mainly Conservative MPs and their supporters in the media. For the new foreign secretary, Jeremy Hunt, to compare the EU with the Soviet Union, was certainly not the worst of the comments. For a large swathe of the Tory Party, the EU was and is the enemy. If Britain needed an effective opposition now was the time but Corbyn is fundamentally opposed to the EU believing it will stop him creating the socialist nirvana in the UK. More than a dozen anti-EU Labour MPs have effectively kept Theresa May in office during recent weeks. So why could Brexit be good for the EU? Despite all its opt outs (euro, Schengen, justice and home affairs) the UK has never felt quite comfortable in the EU and has often blocked attempts, as in defence, to deepen integration. Now the EU has the chance to move forward without using the UK as an alibi. There are many important dossiers from reform of the Eurozone to defence and migration where the EU needs to deepen integration. It now has the chance to move forward without worrying about any British veto. If it can do this then it will demonstrate that the Brits were indeed responsible for the slow pace of integration. But given the many political problems in EU member states one cannot be too optimistic about such a scenario. Most viruses die down or disappear over time. The British anti-EU virus is a particularly virulent strain and there were fears that it might take root elsewhere in the EU. But the shambles over Brexit has been a powerful antidote. At some point the virus will have run its course in the UK as well. The anti-Euro virus in the british body politic has been distilled for over 40 years by the europhobic popular press. And will last unless and until the “idelogical” bias of its editors/owners is defeated in some way. Why was the EU constitution scrapped again? The UK wasn’t ever going to block it, our Government dodged public accountability at every step. Development in the EU will continue to be slow and cumbersome for the simple fact that the approval of 27 is needed for nearly everything. Even with the Queen of Hesitance Angela Merkel on the way out, the rapid rise and fall of Macron just says it all. There are now more pressing points to consider and although there is still much disagreement, it’s also clear that many are beginning to view the world through he same perspective. Progress is possible. This polarisataion of views in reports – being EUractiv of course most here are pro Euro and anti Brexit, like this report – just ignores the referendum result that indicated the UK people majority wish to leave. They weren’t told exactly what that would mean – nnobody knew and still don’t – nor were they told the repercussions of staying in the EU. But look at the discontent generally, with the yellow vests etc. There is a general dissatisfaction with the upward movement of wealth, the increasing inequality and so on. Until the EU makes it clear that the expense of having another layer of bureaucracy is going to benefit the working man, the struggling student and the stressed homeowners, dissatisfaction will show in many ways. So bitching about individual politicians, party policies, arguments in the corridors of power might be very clever, but it misses the point.And the majority of the politicians in the UK who have used Brexit issues to try and further their own careers regardless of making sure it works should be ashamed of themselves. Mrs May has stuck to her guns, has not bowed to, or taken advantage of, media and publicity, and is struggling on. Votes of no confidence speak for themselves when they fail. “Until the EU makes it clear that the expense of having another layer of bureaucracy is going to benefit the working man, the struggling student and the stressed homeowners,” – member states have “sold” the idea of the EU & its benefits quite badly. That’s true. However, in an age of multinationals, you need a multinational body to prevent things such as…. anti competitive behaviour. DG Compo, for all its faults is the only competition authority able to stand up to the corporates (& has a pretty good track record – indeed is a profit centre – given the fines it dishes out). As for the size of the EC – much smaller than most city administrations (e.g, Birmingham). But of course the congenital liars & morons running the UK – May included – had & have no interest in telling things as they are – indeed, the current “entertainment” diverts attention from the poor, the homeless, a crumbling NHS etc. When you go out in the Uk at night – I suggest you walk carefully – you may trip over a homeless person – at record levels by all accounts – & all due to the tories – but hey homeless people don’t count in torieland.